Harmony 9001 30 mm push buttons, pilot lights, selector switches and mushroom head operators provide robust and reliable solutions for a wide range of heavy industry applications. 9001K operators are rugged and include chrome-plated bezels. 9001SK operators include black plastic bezels for corrosion-resistant applications. 9001KX operators include chrome-plated square bezels and provide multi-function operation. Heavy duty, oil-tight, dust-tight, and water-tight without boots. Most units are IP66 rated and are UL types 4, 4X and 13. 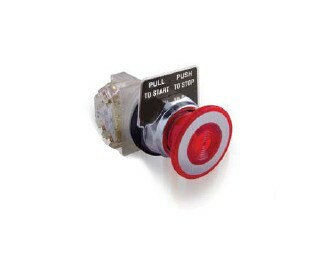 Download the Harmony 9001 30 mm push buttons, pilot lights, selector switches and mushroom head operators catalog below or call 714.835.6211 for more information.